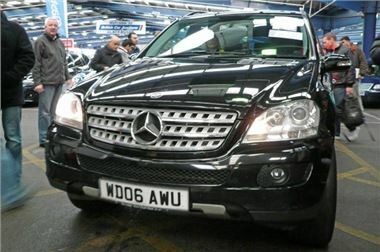 It’s about as rocky on the bottom as it gets at auction, and I guess today’s victim could have been a 101k mile 06 reg Mercedes ML280CDI Sport that, judging by the exhaust fumes, someone had filled with petrol. They had to get it out of the hall before everyone succumbed to the fumes. Bids kicked off at just £12k, but then a bit of a battle ensued, and someone with an intimate knowledge of common rail diesel injection systems (or not) eventually bought it for £16k. The opposite extreme was a 2005/55 and therefore three-year-old Toyota Aygo 1.0 5-door with 26k miles. The car everyone now wants because it will be just £20 tax next year. That sold for a hefty £4,200, so had only lost about £1,000 a year. There will be a lot more de-fleeted 2005/55 reg cars over the next few weeks. Then suddenly it will all stop because the fleets have got rid of their surplus 3-year-old stock. So if you’re looking for an ex-fleet auction bargain, and you’ve still got some cash stuffed in the mattress, you’d be smart to get out there. We’re getting very close to the point where prices can’t drop much lower and will inevitably start rising again. Here’s the list. As usual, ‘s’ means sold. ‘p’ means top provisional bid, ‘pc’ means provisional, but close. ‘n/s’ means not sold. ‘n/w’ means miles not warranted. ‘MNW’ means unknown mileage. ‘dmg’ means damaged. ‘fl’ means facelift. ‘s/r’ means sunroof. Extras like ‘lthr’ and ‘sat’ are specified when they are not standard. Light Commercials: Non Runners, Fleet Direct, Royal Mail, BT Fleet, Vauxhall Leasing, Hitachi, Lloyds TSB, Lex, Northgate, Ex Rental. Lloyds TSB Live Online, Leaseplan, Motability, Lex Live Online, Fleet and Finance, Charters p/x, BT Fleet Live Online, Vauxhall leasing Live Online, Masterlease Live Online, Hitachi CVS Live Online, Volkswagen Services, Multi-source, Eden Group, Inchcape p/x, Private Sure Sell, Non Runners. Light Commercials: Non Runners, Fleet Direct, Royal Mail, British Telecom fleet, Vauxhall Leasing, ING Leasing, Hitachi, Lloyds TSB, Lex, Northgate, Ex Rental. Lloyds TSB Live Online, Masterlease Live Online, Motability, Fleet and Finance, Charters p/x, ALD Automotive, Lex Live Online, Hitachi CVS Live Online, Volkswagen Services, Leaseplan, Multi-Source, Eden Group, Inchcape p/x, Private Sure Sell. BCA's exclusive Commercial Auction View service at www.commercialauctionview.com. BCA Peterborough stages Motorbike sales on the last Friday of each month, with high volume Super Sales featuring ‘bikes from Black Horse every two months. (Next Super Sale on 25th November). Sales start at 1pm and all are welcome to attend. There is secure motorcycle parking on the day and an expert and enthusiastic Sales Team on hand to answer questions. Viewing is on the morning of the sale and BCA can arrange transport to anywhere in the UK. Full catalogue details and a picture of every motorbike entered for the sale will be available online in advance through BCA’s exclusive Commercial Auction View service (www.commercialauctionview.co.uk).